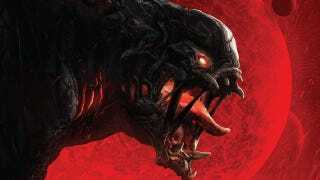 Evolve survived the destruction of THQ one year ago and now the game is ready for a closeup. Game Informer's cover subject is the co-operative/competitive shooter, which sounds kinda like, yep, something from Left 4 Dead, for which Turtle Rock Studios is best known. The game will release this fall for PC, Xbox One and PS4. Its main mode pits four player-controlled alien hunters against a player-controlled alien monster, which grows ever larger and more powerful as matches progress. It sounds sort of like a class-based Left 4 Dead against one bad mutha of a Tank. The game was under development for THQ until the publisher dissolved in a bankruptcy sale last January. Take-Two Interactive bought it for $10 million; Turtle Rock itself bid $250,000 for the property just in case, to keep it going.